Posted: Wednesday, February 15, 2017. 3:52 pm CST. Posted: Wednesday, February 15, 2017. 2:49 p.m. CST. 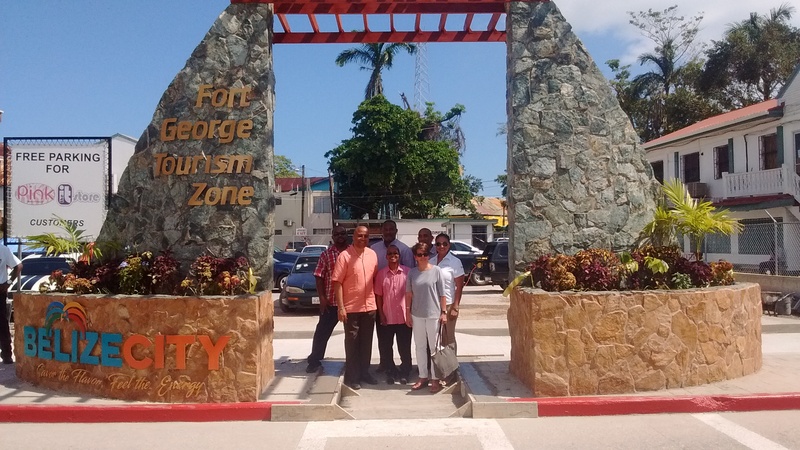 By BBN Staff: Today, the Belize City Council inaugurated its new Gateway monument at the entrance of the Fort George Tourism Zone. The council held a brief opening ceremony for the monuments, which are dedicated to the entrepreneurs of Belize City. Mayor Darrell Bradley, explained that the monuments are valued at $30,000 which formed a part of an $80,000 grant provided by the Government of Canada through the Caribbean Local Economic Development Project (CARILED). Bradley said that the monuments, are geared towards marking off the FGTZ, and that the project is a testament to the Council’s commitment to creating economic opportunities for Belize City residents. “Government can’t create jobs. If we want our city to be sustainable and to be livable, we need to find ways how the private sector can be supported…to create meaningful and sustainable employment for people.” Bradley said. Bradley added that the council conducted several consultations with various partners, such as taxi operators and businesses in the area, on the impact that the monuments would have in the area. He added that the original monument caused problems for residents and those trafficking the areas, and also presented problems for trucks during the carnival season. The project comes at the end of CARILED’s five year project cycle in Belize. According to Marion Villanueva, CARILED program Director, the program will end in the next three months.